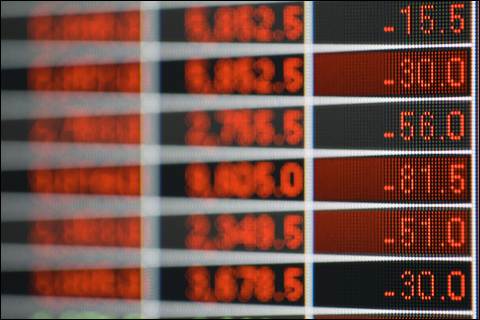 Why Spread Bet and Trade CFDs with Financial Spreads? Financial Spreads was launched with the intention of providing all customers with the best possible service and some of the very best value spreads in the market. The main cost to financial spread betting clients is the spread (the difference between the sell and buy price of a product). The wider the spread, the more costly it is for you to trade. Therefore, to help you keep your trading costs down, we keep our spreads tight. 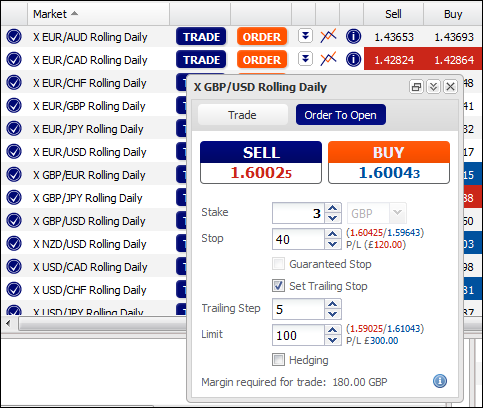 For example, our UK 100, Germany 30 and EUR/USD Rolling Daily markets have 1 point spreads (during market hours). Our USD/JPY market is quoted with a spread of just 0.8 points. It is not necessary to download any software in order to access either our demo platform or the live trading interface. This means that you should be able to access your account from anywhere in the world that has an internet connection. 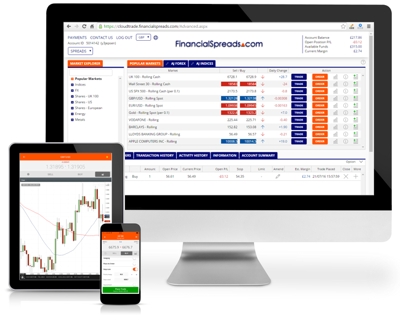 Also see the Financial Spreads mobile and tablet trading apps. Margin is the amount of money you need in your account in order to open a trade. We offer exceptionally low margin requirements across all our markets, meaning you deposit only a small percentage of the total notional value before opening a trade. For example, the Minimum Initial Margin requirement for our UK 100 Rolling market is 30, meaning that for a £1 trade you need a minimum of just £30 in your account to open it. Importantly, you should note that spread betting and CFD trading are leveraged products. These investment options are not suitable for all traders so please ensure that you fully understand the risks before trading, If necessary, seek independent financial advice. For further information on all our margins across the full range of products we offer, please click here. When signing up with Financial Spreads, you have the option of creating a stand-alone spread betting account, a stand-alone CFD trading account or a combined spread betting and CFDs account. We offer both spread betting and CFD quotes on our whole range of markets, so you can always trade the market you want with the product that's right for you. Note that Financial Spreads accounts are subject to status, terms and conditions. We offer thousands of different products to choose from including stock market indices, forex, shares, commodities and treasuries. We quote a mix of Rolling Daily and Futures contracts to suit the style of the underlying markets. You can choose to have your account denominated in sterling, US dollars or euros. Spread betting and CFD trading are high risk. However, at Financial Spreads we want to help you manage and understand your risk, as well as enjoy your trading experience. Every trade you open will automatically have a Stop Loss order attached to it. A Stop Loss order is designed to help limit losses on losing trades without limiting your upside on winning trades. Please note that Stop Losses are not guaranteed (unless you specifically select Guaranteed Stop), so are subject to slippage which means that you may lose more than you allowed for. Also see our Beginners Guide to Stop Losses and our Guaranteed Stop Orders page. Financial Spreads also offer Trailing Stop Loss orders. Trailing Stops are a risk management tool that allow you to manage your risk without restricting your potential profit. Essentially, Trailing Stop orders help you to secure your profits as the market moves in your favour. A Trailing Stop gives added flexibility as the Stop will automatically track your profitable positions so that you don't have to continuously monitor your trade and move your stop manually. You can place a Trailing Stop on the deal ticket when you place a trade. For more information, including a Trailing Stop example, see Trailing Stops for Spread Bets and CFDs. A number of our most popular markets can be traded 24 hours a day, Sunday 23:00 to Friday 21:15 (London time). 24 hour markets include major currency pairs, such as EUR/USD, USD/JPY and GBP/USD, stock market indices, like the UK 100 and Germany 30, as well as gold and crude oil. Financial Spreads offers a range of order types and a totally flexible Stop Loss facility, meaning that you can amend or revise Stops to suit your needs. You can create Limit orders. Limit orders, also known as 'Take Profit orders', will close your trade once the market has hit your desired profit level. We also offer Opening orders which open a new position (along with an associated Stop Loss) once the market hits a specified target price. Our platform comes with free real-time charts. These sophisticated charts represent the historic performance of the Financial Spreads prices which are derived from the underlying markets. With Financial Spreads you can trade from as little as £1, $1 or €1 per point across all the markets we offer, depending on which currency you choose for your account to be denominated in. We don't expect you to leap into spread betting without any help, so we have provided some comprehensive online learning tools. For example, our free Demo Account mirrors the live trading environment but lets you practice spread betting and CFD trading with virtual funds. We have also produced a Beginners Guide to Spread Betting which is designed to help explain the basics to newcomers. Of course, it is important that anyone learning about spread betting or CFD trading should review the full Risk Warning. Don't think that just because our spreads are good value you'll get a lesser service - our customer support is second to none. We believe that Financial Spreads stands out from the competition as a strong choice for beginners and professionals alike. We are committed to quoting amongst the best prices in the industry and feel certain that this, coupled with our customer service policy, will keep you coming back for more. Our customers are our most valuable asset and consequently we want your experience with us to be as harmonious as possible. We pride ourselves on our openness and relish client feedback, so if you have any problems or queries please call or email us. We are at your service.